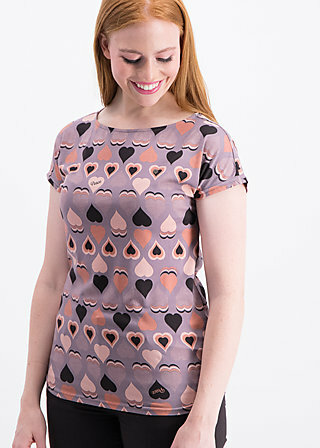 Casual t-shirt made from fine cotton-modal jersey with a bit of stretch and all-over power prints, inspired by freedom, femininity and joie de vivre! The casual cut, the easy-care and supple material and the uncomplicated and limitless options for combination make this everyday shirt into an everyday favourite. With incontrovertible comfort, this sleek beauty with cut sleeves, athletic boat neck and slightly rounded hem will integrate itself into your wardrobe. Combined with your favourite jeans, it's the quick and perfect everyday look with the right amount of colour and you're ready for all sorts of female folk power!